Now that it has been revealed who will be the next Lara Croft in the upcoming 2018 Tomb Raider movie, a lot of people want to know who this young woman is so let me give you a quick rundown. Alicia Vikander is a Swedish actress who received multiple awards for her role as Gerda in the movie ‘The Danish Girl’ and became globally recognized. She now lives in London with boyfriend Michael Fassbender. Alicia is busy working on many upcoming roles including one where she co-stars with James McAvoy – our favourite young Charles Xavier – in a movie called Submergence. For those of you sporting power to women, Alicia also identifies herself as a feminist saying, ‘There’s a change happening, and I want to be a part of it. You see something like Hunger Games or Insurgent proving that a female role can carry a successful blockbuster.’ Go, Alicia. What Will This Movie Entail? With most of us having played the game as youngsters as well as watching the original Tomb Raider movie starring the ever-beautiful Angelina Jolie, we end up wondering what this movie will entail. Many people are also asking if it’s just a remake of the original one or if it’s a different one completely. Well, Alicia has answered the question asked by many. 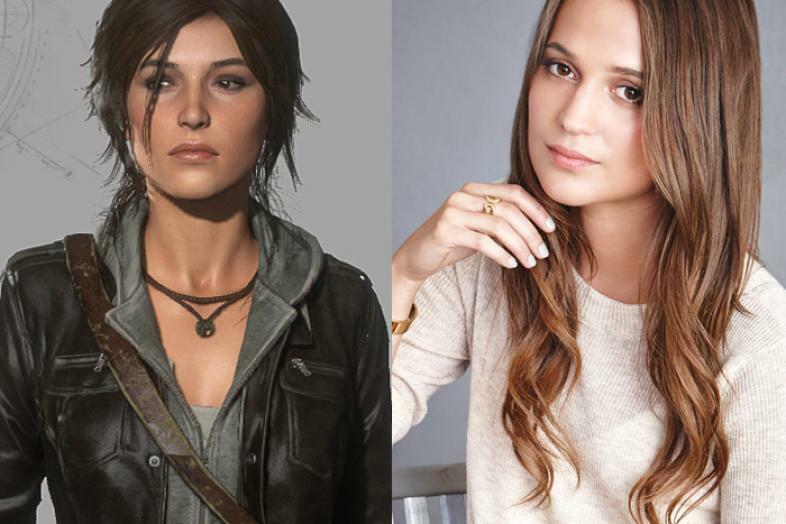 Alicia states that the movie revolves around a younger Lara Croft set off on her first adventure to follow her father’s footsteps. Alicia also says that the movie is there to help people build an emotional connection with Lara. The movie is set for you to get to know Lara on a more personal level. So now that you know who is playing Lara Croft as well as seeing that sneak peek photo of Alicia doing her stunt for the movie, you're probably askingwhen it will be released. Unfortunately for us we still have a long road ahead before we get to watch it. With months more to go, Tomb Raider will only be released on March 16, 2018. When you think about it, she has a lot of training to do as well as the fact that she’s busy with other movies too, a little under a year seems too soon for the actress. Don’t worry, Alicia, we believe in you. Where is the Movie Being Shot? That’s right. Cape Town, South Africa is where all those teaser shots were taken and also where the movie is being filmed. With beaches and surrounding mountains, I am not surprised they chose one of the most beautiful spots on Earth. A few of the scenes were also filmed in the UK, Lara's home country.